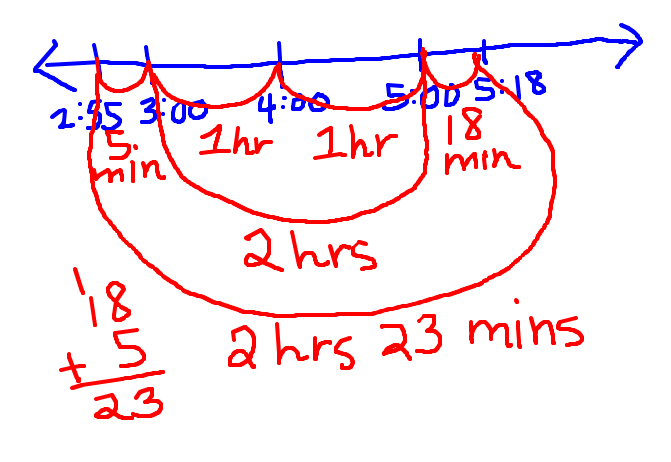 When I was growing up, I learned to do elapsed time problems by subtracting the start time from the end time (and when necessary, borrowing while keeping in mind that there are 60 minutes in a hour). 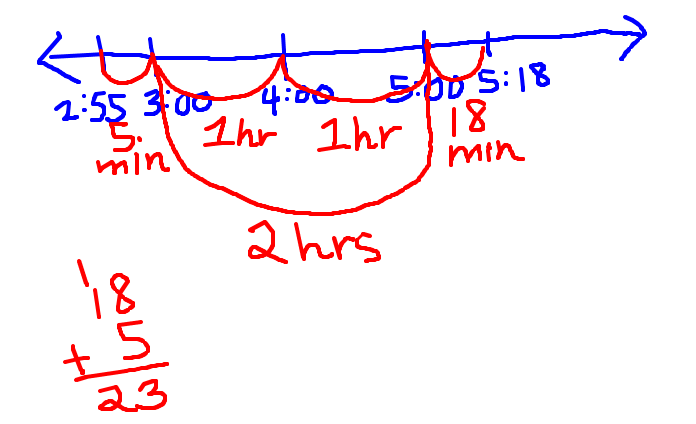 This technique always seemed convoluted, so when a fifth grade tutoring student of mine was working on elapsed time problems, I tried this visual way of solving them, which seemed to be much more intuitive for my student. Let’s say you have a problem like this: A train departs at 2:55 and arrives at 5:18. How long is the train ride? Combine the hours and the minutes, and you’re done! Once you do a few of these, there’s lots of different ways to draw the loops. For example, you could start at 2:55 and loop to 3:55 (1 hour), 4:55 (2 hours), and then from 4:55 to 5:18 (4:55 to 5:00 is 5 minutes; 5:00 to 5:18 is 18 minutes; 5 + 18 = 23 minutes) to get 2 hours and 23 minutes. 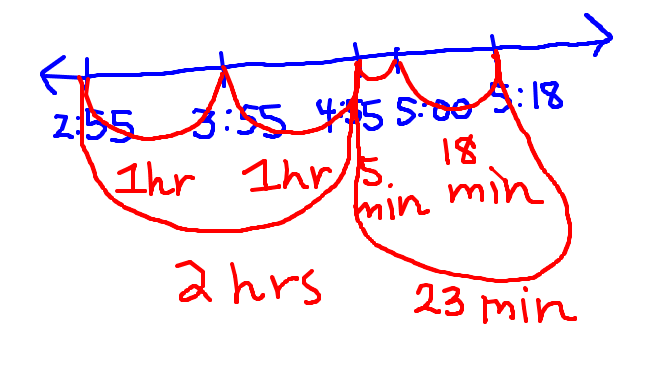 And after drawing some of these out, you can use the same process to do elapsed time problems mentally, too. Just think about counting from one time marker to another and adding up the different loops. *Visiting from this week’s Carnival of Homescooling? Welcome, I’m glad to see you here! Below are some more posts you may enjoy. Rebecca, what a cool and easy to understand visual. I remeber trying to explain a similar method to my daughter when she was younger but I’m sure she would have “got it” much faster if I’d illustrated it. Thanks, Caroline! When my student came to me, I had just done a similar problem by myself the day before, calculating how many minutes were on a tape recording that started and ended at a particular time. So I remembered how I had done it by myself — count the hours, then the minutes on either end — and just tried to draw out what I had done in my head. This is awesome! I’m going to teach my students today this strategy! It’s a great way for visual learners to understand elapsed time! Thanks for sharing! Thanks, Kelley! I’m glad you found found this useful. Let me know how it goes, and thanks for stopping by! This is great! I tried this, and some of my students “didn’t get it”. I taught a T-Chart for those students, and between the 2 methods all my students “got it”! The hours are figured in the first column and the minutes in the other. 4:55 60, then start at one and make marks to 18. I tried this with my son and it worked so well. Thank you for the tip. Finally a night with math homework and no headache! Hey Liz, thanks for posting. Could you explain where you’re getting 53 from? What do you mean by “across the top”? I REALLY like this because it is visual. I plan to use it tomorrow. I think I will “loop” the hours on top and the minutes on the bottom so the numbers aren’t as confusing. Thanks! Hey Shelli, it’s so great to “meet” you here! Thank you for your feedback. Let me know how it goes! I’m glad to help! Im teaching a 5th grade class and im kinda confused. You left the PM and AM out, and my kids were having trouble with this.